In a food processor, mix cream cheese, cheddar cheese and Monterey Jack until combined. Add beer, process until smooth. Toast 1 slice of the bread in oven until crisp, approximately 10 minutes. Crumble the bread to make rye bread crumbs. Add paprika and breadcrumbs made in previous step to cheese mixture. Process. Cook pretzels according to package directions. Cut rye bread into 2" squares and toast in oven for 5 minutes. 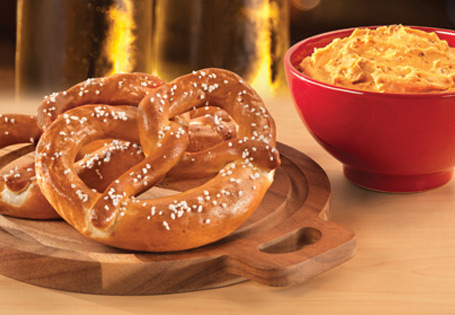 Serve dip at room temperature with fresh baked pretzels, toasted rye bread squares and pickles.